Some of Hoboken’s best bars are ones off the beaten path. And some are so ingrained on their neighborhood block that they are literally built right into a small house. Such is the case with McMahon’s Brownstone Ale House, serving up cheap brews and shots since 1995. Another in a line of fine Irish pubs, McMahon’s has a charm all its own. With just a few places remaining on this seemingly endless Hoboken bar crawl, I find myself left with some bars I’m visiting for the very first time. And after dropping by McMahon’s, it’s hard to fathom that I’ve never popped in here for a drink before. Inside, the long wooden bar seems to take up the place’s entire space with exposed brick along the walls on the opposite side. Above the bar sit a couple of sports jerseys hung overhead while some pictures line the brick, but McMahon’s is hardly known for their decor. What’s actually refreshing is that the place doesn’t jam the “Irish” down your throat. Instead they rely on being a good old fashioned dive and sports bar. Owner, bartender, and former Belfast soccer player Francis, is perhaps the nicest guy I’ve met during my travels. With two buddies to my side, we ponied up to the bar, chatted up the old chap, and shared some war stories. What actually happened was, McMahon’s was having a karaoke night and we spent about 3 hours singing with some friendly likeminded strangers. While the howls of Tracy Chapman’s “Fast Car,” Mr. Big’s “To Be With You,” and- a karaoke staple- Kenny Rogers’ “The Gambler” were likely driving patrons to other places, we were having a blast. Aside from your typical Hoboken happy hour values, the space also houses a pool table in the back. 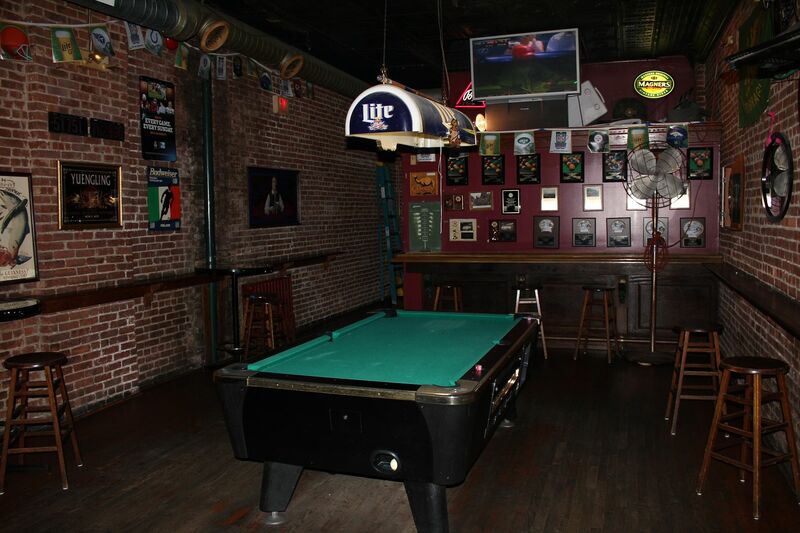 So grab a $4 import or a $2 domestic draught from Francis, pop a few quarters on the table and chalk up that cue, for one of Hoboken’s most unheralded and underrated bars. Preconceived notion – A virtual unknown. I had never passed by the bar or had heard from anyone who had been there. Bar Type – A really fun sports bar with an Americanized Irish pub feel. Music – The karaoke was a-flowing. Value – Good, reasonable happy hour specials- $2 domestics and $4 import beers. Date – Come on dude. Take her somewhere nice. Hookup – When the place fills up, you betcha. Some call it the luck of the Irish. Others argue that you just get drunk and make out. Dance – Here and there, but this is more a sports bar than a place to shake your massive behind. Catch up with a friend – An excellent place for this. First or last drink of the night – It’s not the most convenient place for bouncing around to bars, but definitely works for either. 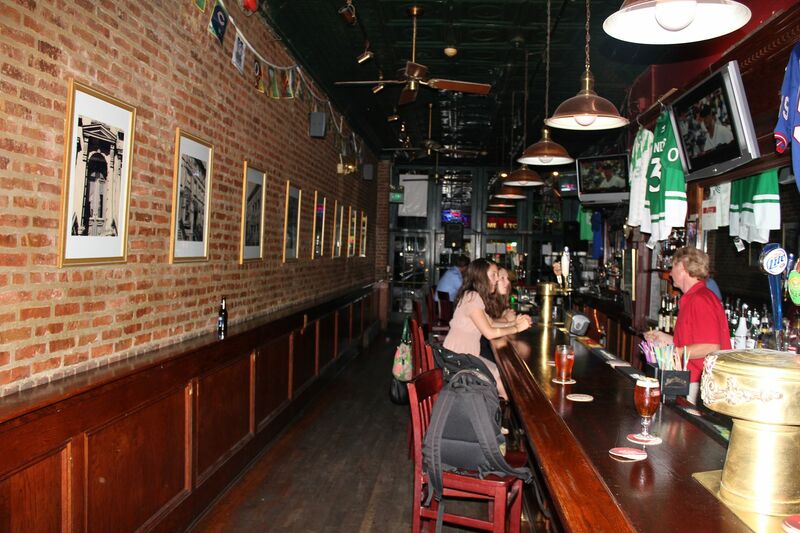 Overall – McMahon’s Brownstone Ale House is a hidden Hoboken gem. Pool table? Check. Good specials? Check. Friendly, family run bar with an interesting bar staff? Check. It’s a bar that doesn’t stand out as anything special, until you’re inside, getting your drink on, and having the time of your life. Well, that’s a little strong but it is a place worth going out of your way for. Our first visit will certainly not be our last. 8.6.